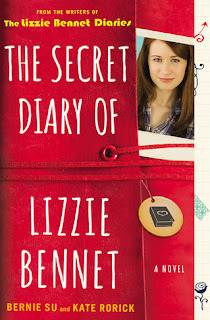 I have to give full disclosure and say that I did not watch The Secret Diary of Lizzie Bennet on YouTube. I heard of it, it sounded great, I intended to watch it, but then never got around to it. Luckily, I was contacted to read the second book in this series, The Epic Adventures of Lydia Bennet, and was given the excuse to borrow this one from the library to read first. I have to disclose a second bit of information and admit that I never read Pride & Prejudice, but it's one of my favorite movies! I know! That is just as blasphemous as when I admit to you that I've only watched all the Harry Potters and have never read any of the books. I KNOW, DON'T KILL ME! At least I still loved them! Anyways, we're getting off track here. Pride & Prejudice is one of my favorite movies and whenever I see a re-telling in book form, especially YA although these ones technically fall under NA, I always pick them up. So, when I was offered to read this series for review, I jumped at it. And, boy am I glad I did. This book was fantastic! I always find re-telling's so interesting, because I look for the ways that they change things from the original, and I am super happy with how it was adapted into modern day for this series. It was seriously ingenious, worked really well, and kept me reading page after page. What was super fun is knowing that eventually Lizzie and Darcy will get together, but waiting to find out when. It's always my favorite part of the re-telling, because he is such a douche in the beginning and it's fun to see how the author will turn him around to become the love interest. I loved the idea of a video blog in order to explain the events going on in Lizzie's life. It was so fresh and modern. This book definitely has me wanting to watch the videos, so hopefully I will get to those soon. If you love a good re-telling of Pride & Prejudice, check out those other re-tellings, but if you want a GREAT one, read this series!